I posted a picture of a cup of this tea on my instagram, but I can't stop talking about it so here we go again. When I reached out for tea recs a few weeks ago, multiple people recommended this and I was so skeptical. I've tried so many kinds of turmeric tea and really disliked them. Nor am I a big ginger fan: I like it in savory cooking but really dislike it in sweets. Ginger and I also have a difficult relationship because of how much it's supposed to ease morning sickness symptoms and it helps me none with my five months of all day sickness. 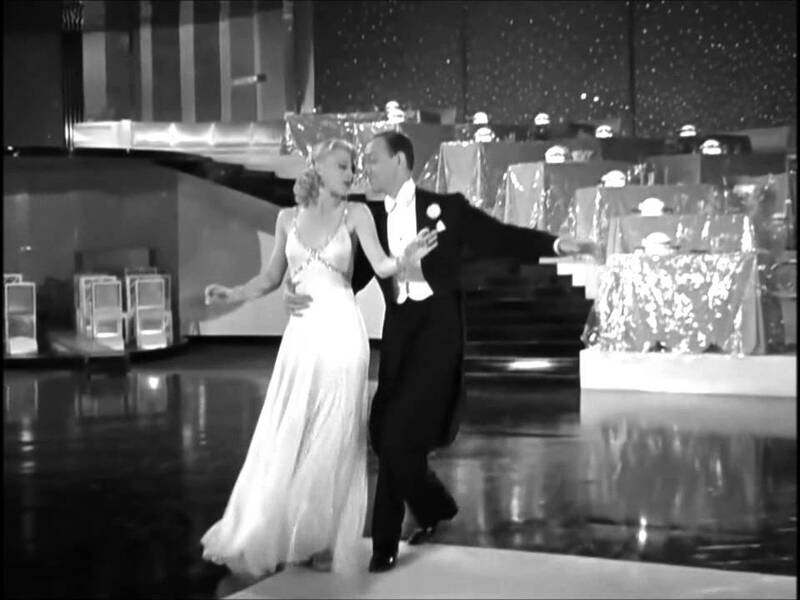 But I do really like Ginger Rogers, and as a seven year old I pretty much scoffed at anyone else who tried to dance with Fred. As compatible as Ginger and Turmeric. I didn't love my first sip of the tea, but I knew we could warm up to each other. And twenty cups in I'm in love. It has this all around mouth feel that gets deeper the longer it brews and it doesn't get bitter. I let Jacob taste it and he said blankly: "Vata tea." Like it was something everyone in the world grew up drinking. But, Mr. Rhodes, not everyone was raised by a hippy. Let's see if I can think of anything else to say about this tea. Yes! I can! But I won't! So you're welcome. And thank you to Jordan and Kate who first recommended this tea! I wouldn't be who I am today without it. I've been baking sourdough recently. I got inspired by this new friend and she gave me some of her starter and sent me to this sourdough blog, and I was up and running, and I've had so much more baking success than I ever expected to have! I've seriously wanted this to be part of my routine since forever ago. My crust is really tough and my shaping efforts are pretty laughable and I'm still learning how to gauge when the dough is fully proofed. But I'm loving it. This beginner loaf has been consistently good - I also made some OK pizza dough and a decent sandwich loaf. Yesterday I took some fresh bread to my neighbor who just had a baby. I put it in a brown paper bag and walked it over hand in hand with Lucy June who was hankering for a peek at some newborn toes. The late afternoon light was stunning, and I thought: *this* is life. I finished Anne Lamott's Bird by Bird this morning. I've been familiar with it for so long and read excerpts of it before, but I'd never read the whole thing. I can't recommend it enough if you like reading about writing. Which is one of my favorite things to read about so it's totally my cup of ginger turmeric tea. I read like five books at a time. I wonder if I would finish more books if I stuck to one, but I find myself craving different types of books at different times of day. Morning reading needs to be thoughtful. Naptime reading needs to be effortless. Evening reading needs to be gripping. In bed reading needs to be beautiful. Currently, my bedtime book is Gilead. It's amazing. I read a couple pages and steep in the richness of it until I'm drowsy. I never want it to end. Jacob and I went on a date last week (this restaurant for you Htown peeps) to use a Christmas gift card. It was amazing. Like entire pigs hanging in the meat locker kind of cool...so maybe that's not your thing...but I loved it. Afterwards we went tipsy shopping at the Goodwill in the ritzy part of town. Tipsy thrifting on date night: highly recommend. I scored a couple Anthro dresses and barely used brand name shoes for the kids. I also giggled a ton because thrift stores can be so hilarious if you're two drinks in with somebody fun. Ok. More secondhand clothes, because this is a fashion blog. 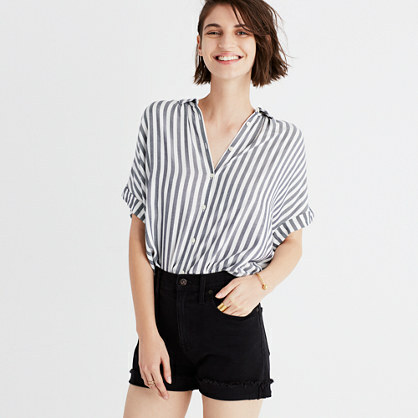 Last summer I used a two year old gift card and bought myself these shorts from Madewell. Full price! Because I am an adult. And I had a gift card. Madewell models roll them up. I roll them down. Because enough white thigh is enough. It was everything I could do not to crop out my forehead wrinkles for this pic because #petty. But I didn't because #authenticity and they're a gift from my dad and I'm turning 32 next week so #embrace. They have been such great shorts: they run laps around my Target shorts, which is good because I spent $75 on them. On shorts. Despite loving them, I wasn't sure I could throw down like that again. Yesterday I remembered that I had a ThredUp credit from some clothes I sent in two years ago and voila! $90 Madewell denim shorts in my size for $26! Now I'm basking in the glow of buying (heavily discounted) quality. 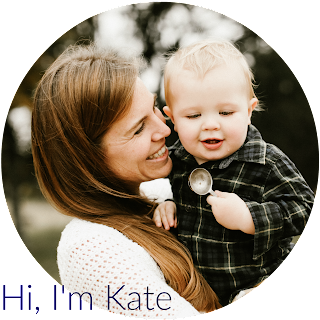 Moral of the story: I have commendable shopping habits and you should try ThredUp. Just like everyone else already told you. Jacob and I have a standing argument about how to feed a baby. 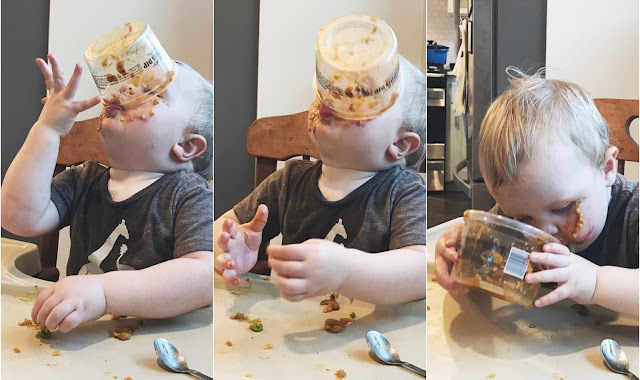 His mess tolerance is very low and prefers to sit down, play the spoon game, and scrape the mouth and chin with every bite. I'm the opposite. I'd much rather eat my food with my own hands and let baby do the same and then deal with the fallout. Visit Kelly for more takes and Happy Mardi Gras! Seriously, you crack me up. I just love reading whatever you're putting down. Happy almost bday!! I am also into sourdough baking. I live in Phoenix and I do my serious bread making only in the cooler month as it is not fun to heat up the house with 500 F oven when outside temperature is 110 or higher. I just looked up the recipe you shared. Do you bake your bread in the cast iron combo cooker as the author recommends? What kind of bowl do you use to proof your dough? I recently made sourdough oatmeal cookies and they are the best! One way I use my excessive sour dough starter is to make crepe or waffles. I just got my first pair of Madewell Jeans. Thank you Christmas card! Seriously amazing. I don't have great buns but these jeans. They work miracles. I love this. Especially your last comment about feeding babies. I'm with you all the way - the hands off method works for me. Lazier and messier perhaps, but totally easier.